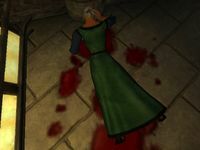 Trevaia is killed at the start of the Knights of the Nine quests. Trevaia, a Redguard priestess, sells spells and potions in the Chapel of Dibella in Anvil. Trevaia wears a middle-class outfit consisting of a blue & green outfit and a pair of doeskin shoes. She carries the key to the chapel and a few pieces of gold. Trevaia doesn't wield any weapons, choosing instead to rely on a selection of spells from the Conjuration and Restoration schools of magic. These are the same spells you can also buy cheaply off her, as her Mercantile is a mere 10. When you approach her, she will introduce herself: "Give yourself to love, pilgrim. I'm Trevaia, priestess of Dibella, and this is Anvil's Chapel of Dibella." When you ask her about Anvil, she will explain the duties of the chapel: "Dibella has shed her special blessings on Anvil. We greet travelers with hospitality, and the needy with an open hand." You cannot invest in her shop. As soon as you install the plug-in Knights of the Nine, Trevaia is killed. 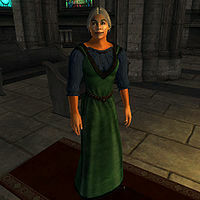 Once the plug-in quests are all completed (through Umaril the Unfeathered), she is replaced by a new NPC, an Imperial woman named Selene Duronia who has the same spells for sale (and is somewhat easier to buy from). Like Trevaia, Selene does not sell potions as she has none that are marked as merchandise. She is one of the few NPCs in the game to be marked for a Scripted Death but not to be flagged as essential. Thus it is possible for her to effectively "die twice". She will only offer to do business as she heads downstairs following her prayer session at the altar. Furthermore she has to be standing still when activated, for example because she stopped to talk to someone else on the stairs. She can do business in the chapel hall between 9am and 10am. The easiest way to ensure that you can barter with her is to arrive in the morning (8-9am) and then wait one hour. Do this until you see her begin to leave her post at the altar, and intercept her by walking into her. She will stop to give you a passing greeting, and as soon as she pauses, initiate a conversation.